We call on you to withdraw your company´s supreme court case against the Indian government. Your legal case threatens access to life-saving affordable medicines for millions of people across the developing world. Access to affordable medicine is a fundamental human right -- do not risk being held responsible for the lives of millions. Stand for healthy people, not just healthy profits by dropping the court case now. In days, Swiss pharma giant Novartis may shut down the lifeline of millions of people across the developing world. Only we can stop this outrage. 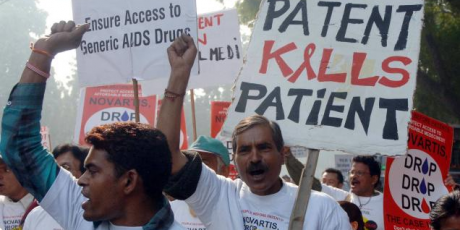 Novartis is suing the Indian government so it can squeeze more profits from the sick and needy. If Novartis wins, it will threaten Indian companies’ ability to produce low-cost medicines for malaria, AIDS, cancer and other life-threatening diseases, depriving millions of the treatments they desperately need. But people power can push Novartis to drop the suit before the final ruling, just as it did for a similar pharma patent suit in South Africa. The Indian supreme court will hold its final hearing is in days -- let’s flood CEO Joe Jimenez with a giant Swiss outcry, demanding that he drop his ridiculous assault against the world’s poor. Sign the petition now -- when we reach 100,000 signatures, we’ll launch a Indian-Swiss double offensive by doing hard-hitting actions in India and delivering the petitions straight to Jimenez at the company’s annual stockholders meeting in Basel in 72 hours!